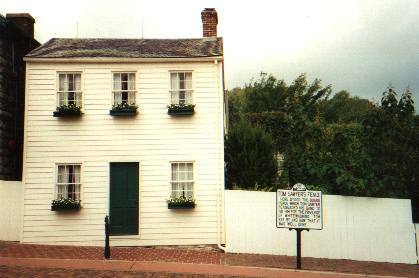 One of the historical towns along the river was Nauvoo, IL. Nauvoo was once the site of a huge Mormon Temple, which was destroyed by a mob in 1846. 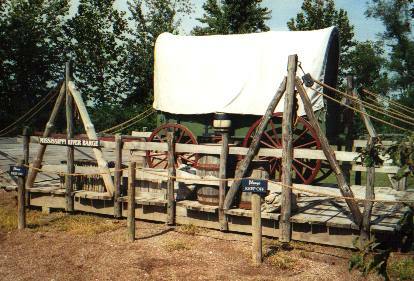 This wagon is part of an historical display about the town and emigration leading to Salt Lake City. 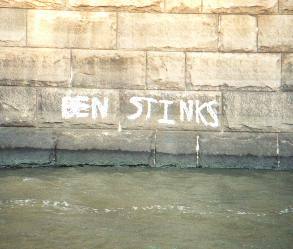 “Ben Stinks” was part of a mystery that followed me down the river. Most bridges seemed to have this message freshly chalked, in a modern day version of “Kilroy was here.” My theory? 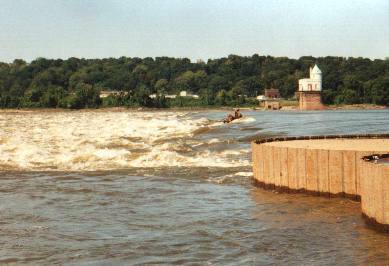 A woman was working out her anger over a failed relationship by canoeing down the Big Muddy. Then one evening I spotted a canoe pulled up along a quiet island beach. It was amazing how few canoes I’d seen, and based on the look of the two scruffy young gentlemen in camp, they were headed to New Orleans, too. As soon as I found out they were doing the whole river I asked, “How’s Ben?” It turns out they had been been the author’s of that chalked message all these miles to taunt a friend that planned to follow later. Adam and Matthew turned out to be jolly fellows, and we shared laughs as I ran into them 3 or 4 more times on down the river. The green material you can see in their boat is a homemade sail. Someday I plan to do another long trip by water and would like to try some rowing and sailing. This site has some gear to modify a canoe for sailing and/or rowing. Mark Twain and Huckleberry Finn have been the inspiration of more than one Mississippi voyager, so naturally I had to visit Hannibal, MO, and visit Mark Twain’s home. There it is, the fence reputedly whitewashed by Tom Sawyer’s gullible friends. Just above St. Louis is a rapids which locals had repeatedly warned me about. Apparently it has been the demise of many boaters through the years, although at some water levels it is barely noticeable. When I was there it would probably have done me in, too. 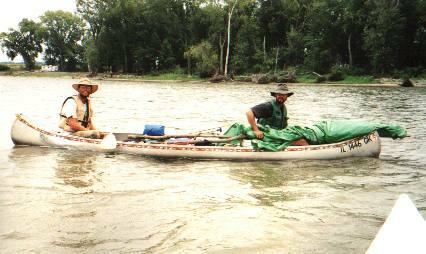 It was an easy portage. From here to Baton Rogue the current picked up dramatically. I’d guess the current above St. Louis averaged about 1.5 mph, and from St. Louis (where the locks and dams end) to Baton Rogue about 3.5 mph. One thing I’ll always remember about this place is the riverboats, the spectacular arch, and how thirsty I was! For some reason I’d run out of drinking water. I had to chance it, leaving my canoe while I filled up my water containers in the visitor’s center below the arch. 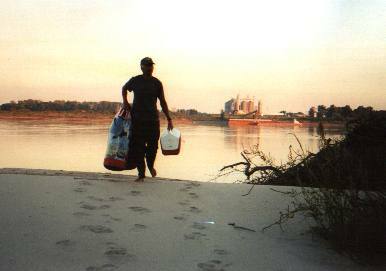 Cairo (pronounced Care-O, locally) is at the confluence of the Ohio and Mississippi rivers. Here I stopped to get supplies, call home, and pick up some mail. It turned out that my maps of the lower river, which I should have gotten weeks ago, had not arrived, and ultimately would never show up. These errands took much of the day, and this camp was so pleasant that I took the rest of the day off, my only “zero day” of the trip. The morning I left town, the fog was thick on the river. I had to really hug the shore to make sure a barge didn’t run me over. 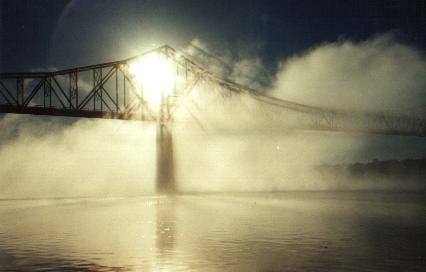 This is the fog lifting off the bridge near the Ohio River confluence. Speaking of fog, I was intrigued by the idea of paddling at night, like Huck Finn. One morning about 2 hours before sun-up, with a bright moon out, I launched into the river. Fog rapidly built, so fast that I had to quickly take bearings of sounds so I could race towards shore. On the way, I twice heard the rapidly rising rush of water and spotted giant steel buoys appear with startling rapidity out of the swirling darkness. Right about then I heard a towboat’s horn and saw the sweep of his spotlight. By this time I knew I was out of the channel, but wasted no time in hugging the shoreline, which I never left until the fog lifted with the rising sun. Looking back, I could see the wall of the fog bank rising like thunderhead from the river. 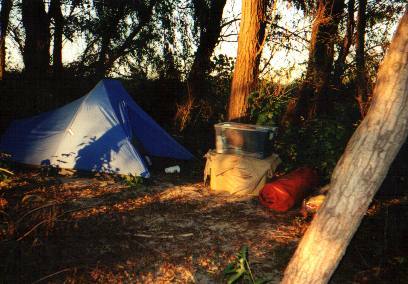 I had pulled my canoe up, finding a dry sandy spot to pitch my tent about 2 feet above the water. I beached my canoe and tied it off to a branch sticking out of the sand. Just before I crawled into my tent I threw my dry bags inside the canoe. Sometime during the night, I awoke to hear water sloshing. Fairly often I’d hear the waves from passing barges, so I started drifting off again. But then something woke me up again, those waves sounded CLOSE! Unzipping the tent I looked out in disbelief; my sandy beach was under water, and my beached canoe was floating. The shallow waves were actually washing AROUND my tent! I leapt up, yanked my tent stakes, and dragged my tent onto high ground. I spotted part of my stove floating around, so I grabbed it and, went to retrieve my canoe. The water had risen so dramatically that the branch I’d tied the canoe to was now underwater! Untying it by feel, I dragged the canoe up higher too and tied it off to the trees. It looked as if I hadn’t lost anything important. For some reason, fish were swirling around in the newly flooded areas. It took me a little while to unwind and go back to sleep. Somewhere upstream some hard rains had fallen! I should have recognized the warning signs when I saw the foam and debris in the river as I set up camp. Click here for photos from my 700 mile trip through the Alaska Wilderness. Amazing!!! Really enjoy reading your story!